The NYAA participates in the PYL Fall Baseball League which consists of a 10 game schedule with a playoff tournament at the end of the season. Scores are kept, however the fall season is used to prepare players for the upcoming spring season with an emphasis on developing kids in practices as well as games. All rules shall be according to the current issue of National Federation of State High School Associations Rule Book, except as noted in the PYL League By-Laws and approved by the League. A coach may interrupt a game at any time in order to instruct a player(s). All players on the game day roster will bat. All players may not sit two (2) consecutive innings. The free substitution rule shall be in effect. Each inning will be either 3 outs or a maximum of of runs per inning as defined by the PYL rules. A player should be turning 9 before May 1 of next year and be no older than 10 before May 1 of next year. The Biddy division competes on fields with 60' base paths and a 44' distance from the pitcher's mound to home plate. Practices and home games are held at the Northwestern Recreation Fields and will typically be 2 to 4 days per week. Practices will begin in late March/early April. A player should be turning 11 before May 1 of next year and be no older than 12 before May 1 of next year. 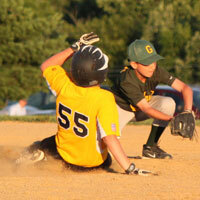 The Midget division competes on fields with 70' base paths and a 48' distance from the pitcher's mound to home plate. Practices and home games are held at the Northwestern Recreation Fields and will typically be 2 to 4 days per week. Practices will begin in August. A player should be turning 13 before May 1 of next year and be no older than 15 before May 1 of next year. The Knee-hi division competes on fields with 80' base paths and a 54' distance between the pitcher's mound and home plate. Practices and home games will be held at the Northwestern Recreation Fields and will take place 3-4 days per week with practices beginning in August. Fall 2018 Registration Fee: $85 (early bird discounted reflected in price). Knee Hi: A player may not play in the "AAA" Division if he/she turned 15 before May 1, 2019. Midget: A player may not play in the "AA" Division if he/she turned 12 before May 1, 2019. Biddy: A player may not play in the "A" Division if he/she turned 10 before May 1, 2019. For more information, visit the Parkland Youth League Baseball.